When will your liquor arrive? Sorry, you will see no liquor at our specialty beer store. The initiative approved by Washington State voters not only removed the sales of liquor from the state hands, but it put it in the hands of large businesses, with a stipulation that stores must be at least 10,000* square feet. Our beer store is over 8,600 square feet too small to qualify for the spirits license and doesn’t qualify for the exceptions. Where can I get liquor? Starting Friday, June 1st you can look to your neighborhood grocery store for liquor. Or, if your regular liquor stop was a contract liquor store, you should still be able to visit that location for your selection. For the biggest nearby liquor selection, I’ve been pointing folks 3.8 miles South of the store, to the Tahoma Market. How much will liquor cost? That depends on the store you visit. I-1183 imposed a 10 percent distributor fee and a 17 percent retail fee on spirits to reimburse the state for millions of dollars in lost revenue. If you’re looking for cheapest liquor selection, consider looking to house brands of Costco, Fred Meyer, Safeway, and other corporate giants. I heard there’s ongoing arguments against I-1183. 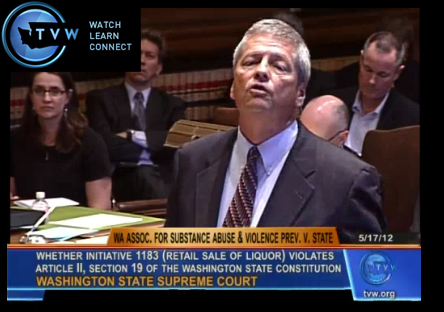 Yes, the Washington Association for Substance Abuse & Violence Prevention v. State and John McKay, et al. was argued before the Washington State Supreme Court on May 17, 2012. The court was asked to determine whether Initiative 1183 violates Article II, section 19 of the Washington State Constitution; the Court is expected to return judgment on May 31st.